Customer satisfaction has reached its highest level since the second quarter of 1995, according to the latest American Customer Satisfaction Index. The ACSI report indicates customer satisfaction in two economic sectors--retail, finance and insurance; and e-commerce. Satisfaction rose 0.3 percent to 74 (out of 100 points), continuing a growth pattern seen in the last two years. The final-quarter report for 2003 shows satisfaction up a substantial 1.5 percent over the previous year. Fast food--included in the retail category--improved from 71 to 74 points, making it the biggest gainer in the latest report. Pizza Hut made the category’s biggest jump, up 7.1 percent to 75. KFC improved 10 percent since the fourth quarter of 2002. The category leaders were Papa John’s (76), and Domino’s Pizza and Pizza Hut; each earned 75 points. Also included in the retail category are department/discount stores, in which Kohl’s remains the leader despite a 6 percent drop to 79. JCPenney, however, jumped 6.8 percent to 78, and Target and Dillard’s tied with scores of 77. 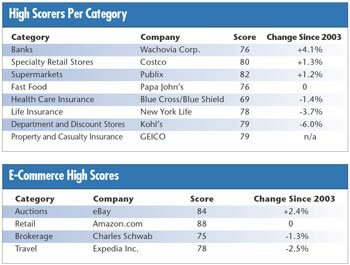 In the specialty retail category, Costco is ahead of its competitors with a score of 80. Lowe’s and Sam’s Club are relatively strong, both scoring 77. Best Buy (72), Home Depot (73) and Circuit City (73) rounded out the category. In the supermarket category, Publix remains the leader with a value of 82, up 1.2 percent. Its nearest competitor is Supervalu at 77. Kroger and Safeway are tied for last with 71 points. In the financial services class, the highest score went to the life insurance and property/casualty insurance categories, with 77 and 78 points respectively. Farmer’s Group’s 4.2 percent increase to 75 still leaves it well behind GEICO (79). Health care insurance has not scored well with customers, with an average category score of only 70. Blue Cross/Blue Shield earned the category high of 72. The ACSI is produced through a partnership of the University of Michigan Business School, the American Society for Quality and CFI Group, and is supported in part by Market Strategies Inc. and ForeSee Results. To view all sector scores, visit www.theacsi.org. “Driving Productivity and Minimizing Rework in the Quality Control Laboratory” is the latest study by benchmarking researcher Best Practices LLC. The report reveals that quality executives in the pharmaceutical industry must become involved with quality control in the face of increased FDA scrutiny. The report explores key drivers that optimize productivity and minimize costs in the quality control lab. It also highlights seven of the world’s top 15 pharmaceutical companies: AstraZeneca, Aventis, Bayer, Eli Lilly, GlaxoSmithKline, Pfizer and Pharmacia. Also included in the report are detailed operational best practices to help companies manage laboratory employee productivity, facilitate testing schedules and workflow, enhance productivity and quality, and improve operating efficiency. 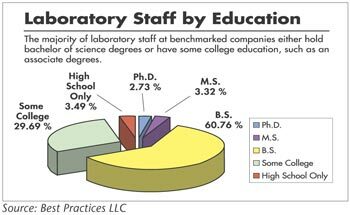 For example, one benchmark partner recently began employing floor supervisors to spend 100 percent of their time in the laboratory. The supervisors divide their time between bench work and in-lab supervision. This management approach improves talent retention through intra-lab promotion opportunities, enhances on-the-job training for inexperienced workers and provides closer supervision of day-to-day activities. The 84-page document includes 22 informational graphics, 31 data graphics, 14 manager narratives and 15 best practices. To download a report summary, visit www.best-in-class.com. The International Organization for Standardization has launched a Web site aimed at promoting environmental awareness in children. The Kids’ ISO 14000 Programme is currently being rolled out internationally. The program was created by professor Takaya Kawabe and Miyuki Koyama, respectively president and secretary-general of ArTech, a Japanese nonprofit, nongovernmental organization. It employs a simplified version of the plan-do-check-act methodology used in the ISO 14001 environmental management system standard. Open children to the value of networking with peers in other schools, communities and countries to bring collective action to global environmental issues. The Kids ISO 14000 Programme Web site can be found at www.iso.org/iso/en/kidsiso14000/index.html. The site features introductory pages geared toward children that answer questions such as “Why is it so special?” “Who created it?” “What’s ISO’s involvement?” “How does it work?” and “How do we participate?” An introductory-level workbook will soon be available from the site. Additionally, ISO has published a promotional brochure, “The Kids’ ISO 14000 Programme,” which is available for free through the ISO Kids Web site. The American Society for Quality has released a new body of knowledge for its Certified Quality Auditor examination. Beginning June 5, all examinations will include the new content, which reorganizes the existing body and includes new material. There are five major topic areas in the new body of knowledge, compared to seven in the previous 1999 version. The exam format will be a five-hour, 150 multiple-choice question test, including case studies. Each study provides a brief scenario outlining critical details about an audit situation. Additionally, each case study will be supported by related audit documents. About 15 to 20 percent (25 to 30 questions) of the test will be devoted to these case studies. Although the related questions will use the same four-choice answer format as the rest of the test, the use of scenario details and sample documents will allow candidates to apply critical thinking skills in evaluating realistic situations, according to Katie Ferguson, test developer of certification offerings at ASQ. In February 2003, ASQ conducted a job analysis on the CQA exam to identify key tasks performed by certified quality auditors and the knowledge base required to perform them. The results of the analysis identified which tasks and knowledge areas of the current body of knowledge should be removed or included. “We’d been hearing about the need to develop a more practical exam, one that truly demonstrates the proficiency of the auditors,” explains Sally Harthun, manager of certification offerings at ASQ. Certification is formal recognition by ASQ that an individual has demonstrated proficiency within--and a comprehension of--a specified body of knowledge. It is solely peer recognition and not registration or licensure. It demonstrates that the certified individual has the knowledge to ensure the quality of an organization’s products and services. ASQ is a leading authority on quality, with more than 104,000 individual members and 800 organizational members. The organization’s goals are to advance learning in quality improvement and facilitate the exchange of knowledge to improve business results and create better workplaces. To find out more about ASQ certification, visit www.asq.org and click on the “certification” tab. --John P. Friel, president and CEO of Medrad Inc.
--John Heer, president of Baptist Hospital Inc.
--Rob Marchalonis, general manager of Stoner Inc.
IXPERION has scheduled this year’s U.S. and European Six Sigma in Finance conferences for April 20 and 21 in Chicago and May 25 and 26 in London. The events are a response to the growing demand for an unbiased information platform focused exclusively on Six Sigma for finance operations that are tightly regulated and prone to substantial financial risk. Presidents, vice presidents and senior Six Sigma leaders will gather in Chicago and London to discuss how to reduce variation and enrich their strategies with Six Sigma tools. Organizations presenting at the conference include GE Mortgage Insurance, Merrill Lynch, Bank of America, HSBC, Zurich Financial Services, Motorola, the U.S. Mint, Lloyds TSB, JPMorgan Fleming Asset Management, Wachovia, Capital One, Wells Fargo Bank, Toshiba, Sun Microsystems, Skandia and NCR Finance, among others. Presentations at the conference will cater to those responsible for delivering high-quality financial products to customers. Delegates can also register for interactive Six Sigma workshops and master classes at each conference, accruing a combination of theoretical knowledge and practical insight on topics such as transactional lean and Six Sigma, design for Six Sigma in finance, project selection and creating a voice of the customer infrastructure. For more information about the conferences, or to register, visit www.ixperion.com. Orion Registrar has been accredited to perform audits to the AS91000 aerospace standard by ANSI-RAB. AS9100 is an international aerospace standard for quality assurance in design, development, production, installation and servicing. It’s based on the requirements of ISO 9001:2000, but it also includes government, regulatory and industry-specific requirements. It incorporates requirements of both civil and military aviation aerospace applications. For more information about Orion Registrar, visit www.orion4value.com. Beta LaserMike, a manufacturer of precision measurement and control systems, has received a patent for its Snap Technology software contained within the UltraScan DSP ultrasonic wall thickness measurement system. Used by manufacturers of extruded plastic pipe, tube and cable products, the UltraScan measurement system provides measurement and control of minimum wall thickness. Previous incarnations of the testing system required complicated setup for each product. Snap Technology allows users to begin their extrusion line and immediately measure a product’s wall thickness. The UltraScan DSP automatically finds the product and begins to measure immediately, requiring only a simple size calibration. To learn more, visit www.betalasermike.com. Aegis, a leader in industrial software in manufacturing productivity, and Statit’s e-Server technology will be combined to provide Web-based SPC reporting to Aegis’ customers. Aegis will now integrate its manufacturing execution system into Statit Software’s e-Server technology. Aegis’ iMonitor software will provide data to Statit’s e-Server for analysis and will then be able to query e-Server for results, reacting by issuing out-of-control alarms and providing the end user with SPC charts via the Web. For more information, visit www.statit.com. Nikon Instruments Inc. has signed an exclusive agreement with Bacus Laboratories Inc. to integrate Bacus’ WebSlide virtual microscopy software with the enhanced version of its digital COOLSCOPE VS. The agreement will enable pathologists, educators and researchers to produce, view and distribute virtual slide images of their glass slide specimens. By combining Bacus’ software technology with COOLSCOPE’s digital capabilities, users will be able to capture the entire specimen area (or portions of it) at high resolution and automatically assemble it into a virtual slide to view it. The combined technologies enable users to view specimens through a standard Internet connection. For more information about the COOLSCOPE VS, visit www.coolscope.com. To learn more about Bacus Laboratories, visit www.bacuslabs.com.